Missing out your favorite soaps, serials, talk shows or reality shows that you used to watch on your iPhone? Downloading a few of your favorite seasons takes up several GB of your iPhone 7 memory. However, when you want to shoot video for a moment, a pop up will alert you that not enough storage. In fact, every iPhone owner faces memory storage issue no matter what GB iPhone7 they are having. One bitter truth is a single video on your iPhone occupies great space as compared to several photo albums. Releasing iPhone 7 video space is a time-consuming task and doing it manually appears quite boring to all of us. Many of the iPhone users stay deprived of the storage-hungry 4K video feature that consumes double amount of memory and offers incomparable video resolution on iPhone 7. We all know that sweeping away the mess is never easy. The feeling of being unable to capture new photos and videos is terrible. Here we list some ways to free up video space on iPhone. Overall, after I tried many ways that I find the most hassle-free way to clean up iPhone 7 video space is using iMyFone Umate Pro / iMyFone Umate Pro for Mac. This miraculous iPhone space cleaner offers the option of backing up large video files without compromising on the quality. It saves and backs up your memorable videos in the same resolution. Once the videos are backed up, a single click is enough to wipe out unwanted massive video files that were eating up your iPhone 7 memory. iMyFone Umate isn’t limited to backing up your videos and deleting them in just one click. It also offers numerous features to iPhone users including the outstanding junk cleanup feature that removes unnecessary and redundant files saved on your iPhone 7 without being in your knowledge. Moreover, another smart feature is “Photo Compression and Backup”. 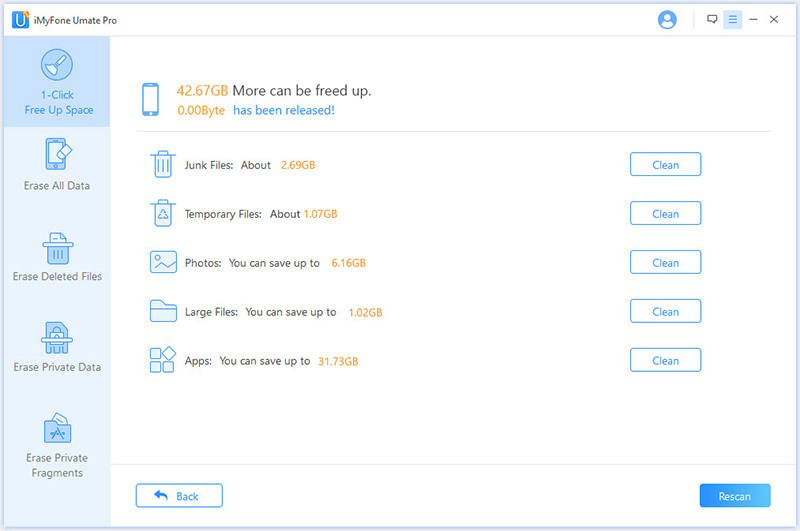 It offers photo compressing feature without dropping the quality, creates a backup of original photos (with similar resolution) and then eradicates it straight away releasing ample amount of space on your iOS device. In addition to this, it also helps in removing unused apps that are not in use and were downloaded either due to immense fame or curiosity. This wondrous iPhone space saver is always there to free up space for unlimited fun and entertainment. The most people get used to clearing up iPhone 7 video space by removing the unwanted videos one by one manually. That means you have to delete and clear your space by selecting and removing the videos on your own. Though, it would take quite longer to finish this way. Tap on “Photos” icon, view your video collection, tap “Delete” and eradicate it individually. Here goes another way to get rid of unwanted videos on your iPhone is by tapping on the “settings” icon. This is a manual method. Once you are there, hit the “general” tab and after that “usage” tab. Now wait for a couple of seconds for your iPhone 7 to present the storage information. The complete information about videos that you have stored on your iPhone will appear near the top of the list and from here you can delete the ones you want. Steps: Tap Settings > General > Storage & iCloud Storage > Manage Storage under Storage > Videos. Then select the video you want to remove, and swipe it to left, tap the red "Delete" button. If you have downloaded tons of movies, videos, funny clips, or TV shows on your iPhone, or you recording many videos by yourself, clearing them up is no easy as downloading them. HD videos particularly eat significant space memory on your iPhone 7 and removing them can make a huge room for a bunch of other stuff that you can do on your iPhone. Try out our suggested ways right now to clean up iPhone 7 video space right away.